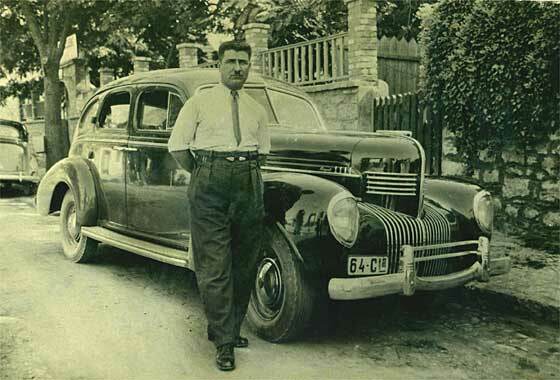 Intriguing photos received from Marek Kolibal (Czech Republic) of car purchased by his father. He says it is a NW A VIERER made in 1900 in Koprivnice, then in Austro-Hungary. He is looking for documentation for this car. He believes the engine was originally a boxer Benz engine or a Hardy engine, but he cannot find any more info.-- This one is a little too specialized for us and none of our experts had information they could provide. Possibly updated. If anybody can help at all, please contact us. One more of a number of photos received from Cicos Florin in Constanta by the Black Sea (Romania) who is interested in old cars of Romania and Constanta. Recently he purchased in the 'flea market' a page from an English photo album with photos on one side and programme of a musical evening interspersed with names from the Dransfield Family. 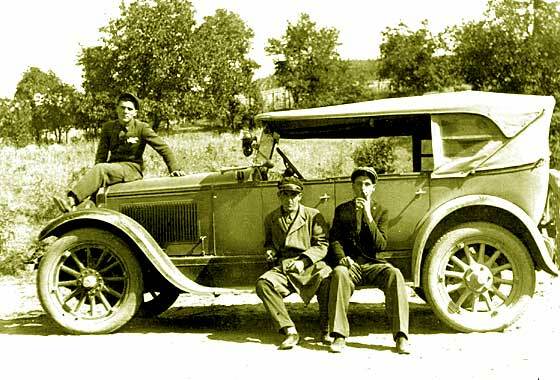 -- Our John Warburton confirmed that this was a cca 1903 Clement 14HP Tonneau and we need more info on the Dransfields. 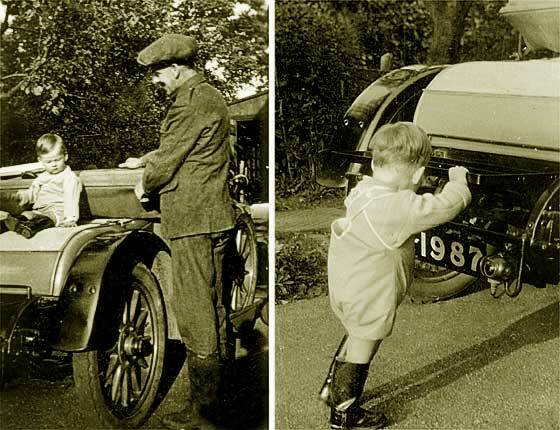 Fascinating photo from Jenny Williams (UK) of car being used as a domestic vehicle in London around 1910. 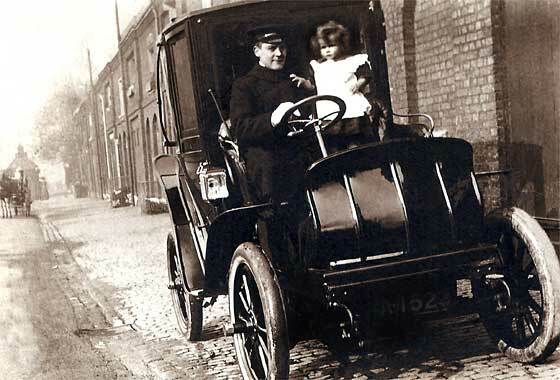 The reg A1523 she identified as London Jan 1904-May 1905.-- Very unusual vehicle identified by John Warburton, made by British Electromobile Co 1902-1920 in Lambeth, London. Initially using French Krieger electrics but later Contal. Bodies from London and Gloucester. Mostly 'town broughams' or landaulette as this one. Taxi fleet in 1908, near end of manufacture, then hire to end. Photo received from Alan Weeks of Swythamley Historical Society (UK) saying it was taken at Hydecroft, Lowfield Heath, near Crawley in Surrey, around 1920, by courtney Brocklehurst. (see other Help Pages) -- Relevant parts of the car are missing but a round bonnet with no air vents. Most round bonnets are hinged at the centre or at 3/9 o'clock. This is about 11 o'clock which strongly suggests a Delauney Belelville. The bulkhead design suggests cca 1911 Delaunay Belleville Two Seater. 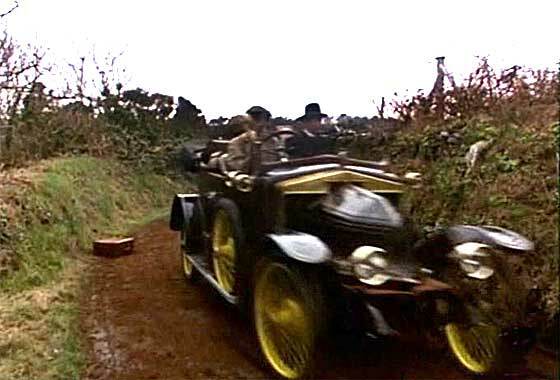 Cinema screen grab of a vehicle which appeared in an English film comedy "Stiff Upper Lips" made in 1998, where the vehicles are being investigated by IMCDB. Starring Peter Ustinov and Prunella Scales. 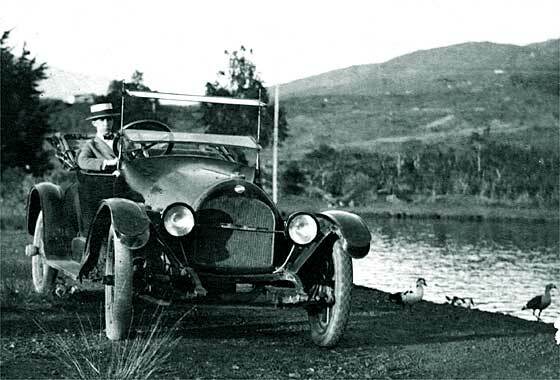 -- The car is relatively unusual being a British cca 1912 Siddeley Deasy Tourer recognisable by the bulkhead radiator. Deasy were made in Coventry and took on the name Siddeley in 1912 when JD Siddley joined from Wolseley. Engines originally Aster but later Knight from Daimler. 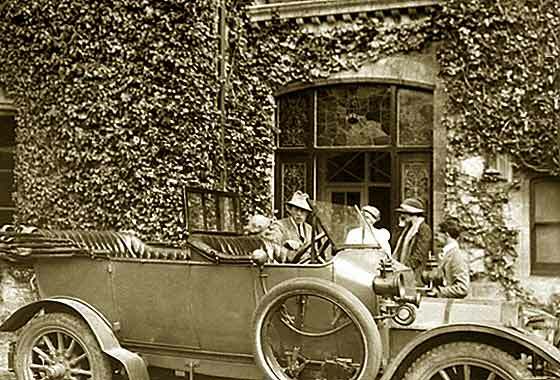 Photo received from Alan Weeks of Swythamley Historical Society (UK) saying it was taken around 1922 at Hawkhurst Court in West Sussex, by Courtney Brocklehurst. Lady Helen Brocklehurst is in the middle between the two cars. 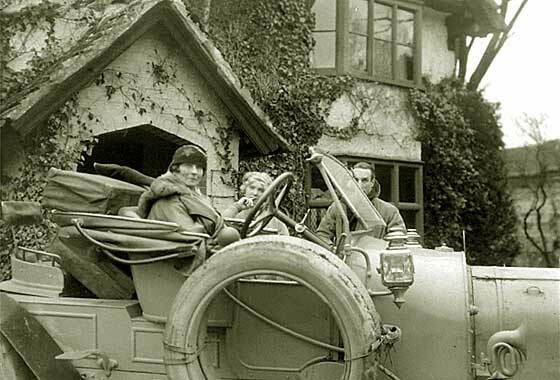 -- The vee rad on the right says snazzy cca1913 Vauxhall Prince Henry Two-seater. Originally called the the Model C, two cars did well in the RAC 2000 mile Trial so three cars were entered for the 1910 Prince Henry of Prussia Trials. Later replicas took on name. A very interersting and unusual car being investigated by the AACA (USA). Remained unidentified for some time. -- This is from the 'cyclecar' era which was not long lived in USA. It was made by the American Voiturette Co in Detroit between 1912 and 1915 and having a quirky name Car-Nation. Came in two seater and four seater versions, air cooled engines. See second photo for distinctive front. Car-Nation bought out the Keeton Motor Car Company, but both went bust in 1914. 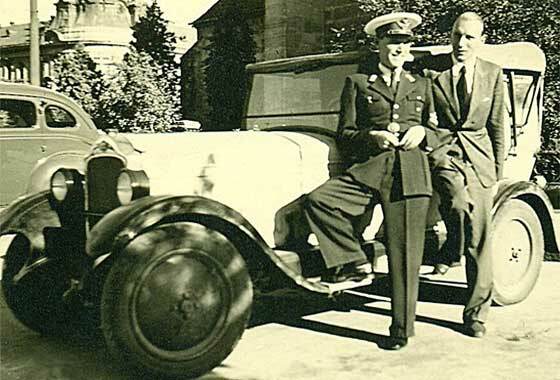 Tiny photo received from Alan Carr (Canada) saying it was taken in 1929 England showing him and his father. It had been pronounced by Rover expert as not Rover and not the later Vauxhall. Photo was too small so we asked for higer res. copy. -- Early investigations suggested it was a Rover, - but as an expert .... Later we got the larger definition photo and subsequently a note that he had now been given advice that almost certainly it was a Rover 12hp, around 1912 - 1916. Photo received from Priscilla Burcher (Colombia) saying she would would appreciate if we can identify this car. The man driving the car is her uncle. She believes it was taken in 1930 in Colombia, South America where he always lived. It is an imported car, perhaps Ford UK ? -- Regret not a Ford UK but a car from USA. Name decided by founders over a coffee in 1902 in Terre Haute Indiana. This is cca 1918 Overland 90 Country Club Touring. Distinctive radiator used for only a short while. Photo received from Alan Weeks of Swythamley Historical Society (UK) saying it was taken at Hydecroft, Lowfield Heath, near Crawley in Surrey, around 1920, by courtney Brocklehurst. (see other Help Pages) -- Smart car made in Manchester. Registration issued by London County Council in late summer 1919. 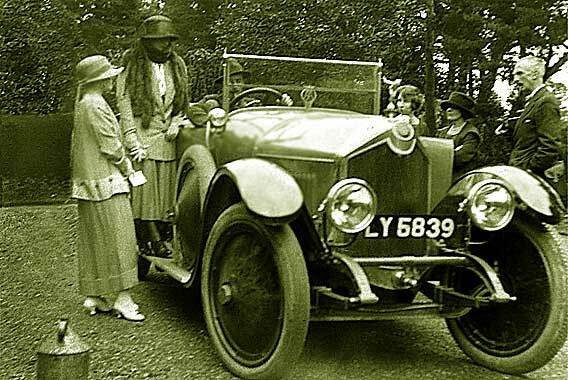 The car is 1919 Crossley Manchester 25'30 5 seat Tourer. Crossleys made gas engines in 1866 but as teetotals did not sell to breweries. 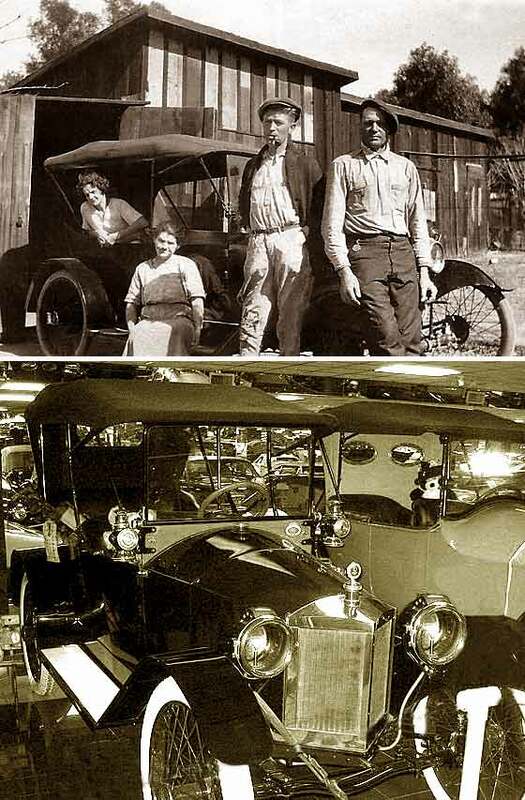 Cars in 1904 becoming high quality maker to 1937. 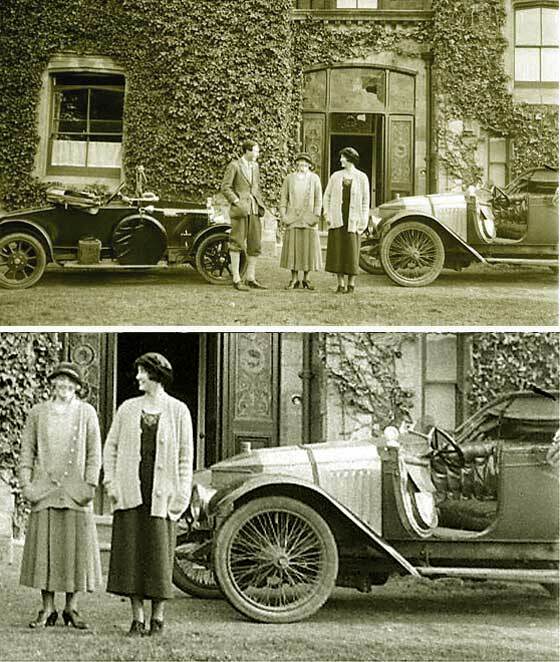 Photo received from Alan Weeks of Swythamley Historical Society (UK) saying it was taken around 1922 at Hawkhurst Court in West Sussex, by Courtney Brocklehurst. Lady Helen Brocklehurst is in the middle between the two cars. 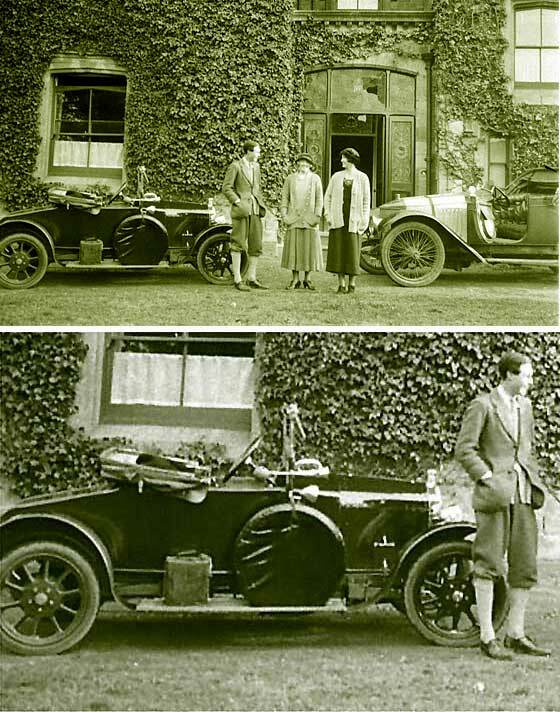 -- The car on the left is is a neat little cca 1922 Wolseley Ten Two-seater. Wolseley was an Irishman who started the Wolseley Sheep Shearing Machinery Company in Sydney Australia in 1896. Had branch in Birmingham UK where he employed Herbert Austin. One of a number of photos received from Cicos Florin in Constanta by the Black Sea (Romania) who is interested in old cars of Romania and Constanta. -- This photo shows another American car in use in Romania. 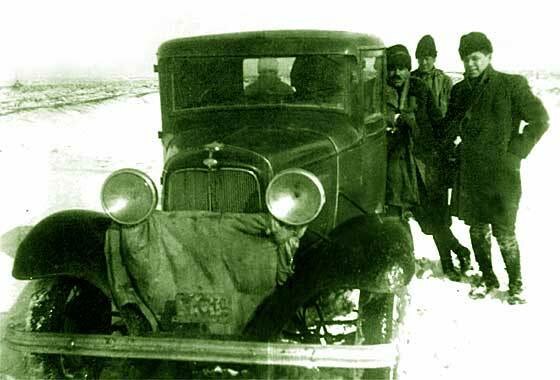 From the phos received so far, the entire American car scene was available in Romania in the mid twenties. This is a rather nice cca 1926 Buick Standard Six Four Door Touring. Dating is suggested by cat still having a split screen, having six stud rear hubs and no scuff plates. One more of a number of photos received from Cicos Florin in Constanta by the Black Sea (Romania) who is interested in old cars of Romania and Constanta. -- In view of the photos received so far, which were all of American cars, this one makes a pleasant change in being an European car. 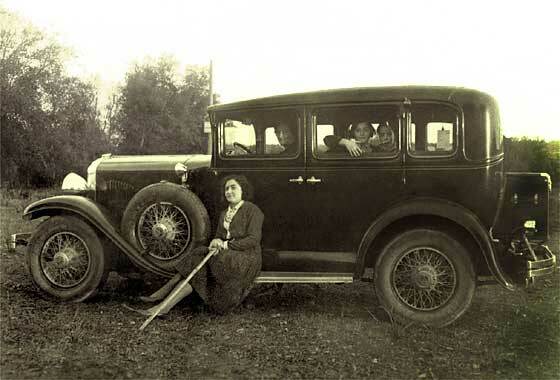 This photo shows a French car made in Paris, namely a cca 1927 Citroen B14 Saloon fitted with interesting faux landau irons at the rear. Citroen was the first mass producer of cars in Europe in 1919. Photo received from Debbie Brenner from New York (USA) saying she believes photos are from the late 20's or early '30's because the baby in the photo is in her early to mid 80's now. 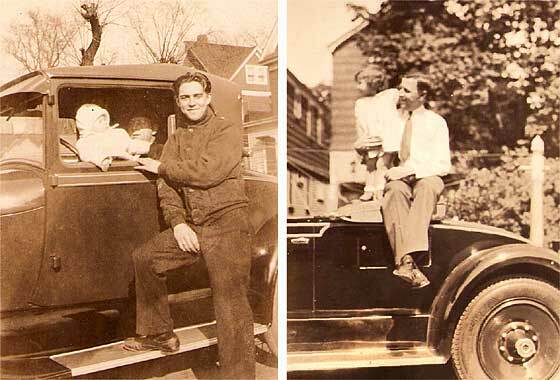 Photos were taken on Long Island either Nassau county or Queens county.-- The car on the left is a cca 1928/9 Ford Model A Sport Coupe. It has the visor which the cabriolet doesn't have. 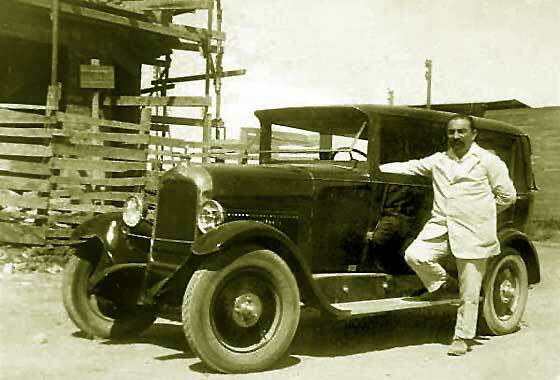 The car on the right by the eight lug wheels and the pattern on the door tell us 1928 Packard Model 443. Help by AACA. One more of a number of photos received from Cicos Florin in Constanta by the Black Sea (Romania) who is interested in old cars of Romania and Constanta. -- Nice to have another European car in use in Romania after the many Americans which seemed favoured at the time. However, this one was about to become that year part of General Motors, and was by 1931 totally American. This is a cca 1929 Opel 4'16 Tourer from the 'bread & butter' range taking over in the late 1920s. One more of a number of photos received from Cicos Florin in Constanta by the Black Sea (Romania) who is interested in old cars of Romania and Constanta. -- This one had me frustrated because I thought I knew the logo but could not remember what. European with American influence. Interesting louvers. Our John Warburton put me right. American all the way from Lansing, Michigan. This is a cca 1930 REO Flying Cloud 4 Door Sedan, - which has characteristic wavy louvers. 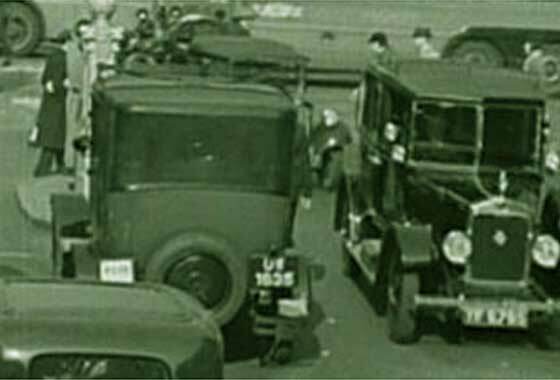 Cinema screen grab of a vehicle which appeared in a 1936 English film by Alfred Hichcock about a Scotland Yard undercover detective is on the trail of a saboteur who is part of a plot to set off a bomb in London. -- The car is unusual in being a development from first principles of motoring rather that variations on Benz or Panhard. First ones were made in Birmingham in 1895. This one is a cca 1931 Lanchester 21 Saloon. Lanchester was taken over by Daimler who belonged to BSA. One more of a number of photos received from Cicos Florin in Constanta by the Black Sea (Romania) who is interested in old cars of Romania and Constanta. -- This reverts to the theme of American cars and not as easy as at first seemed. Ford B it was, but inconsistencies. Our friends at the AACA came to the rescue with confirmation of cca 1932 Ford B Pickup, due leaning guy's arm position. Debate if cut-down Saloon or, as has straight windcreen, Pickup. Later saloon grill; 4 or V8? 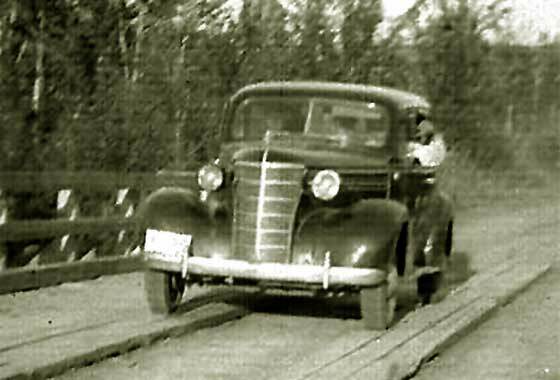 Photo received from Sandra Wasylciw from Northern Alberta, (Canada) saying this car belonged to her Grandfather but nobody is left that can tell her what make, model and year it is. She thinks it is prior to 1951 as her mother and father took it on their honeymoon in that year. -- The photo is a bit small in resolution and appears to be a scan of a inkjet printed copy. Definition is therefore relatively poor but we are now able to confirm that this is a cca 1938 Chevrolet Master Two Door Sedan. Photo received from John Wells. Sydney, (Australia) saying he has recently inherited some photographs which once belonged to his uncle who when he was a teenager he owned various sports cars. All cars he is pictured with remain a mystery to John. -- Registration is Bristol County Borough Council issued about July 1939. 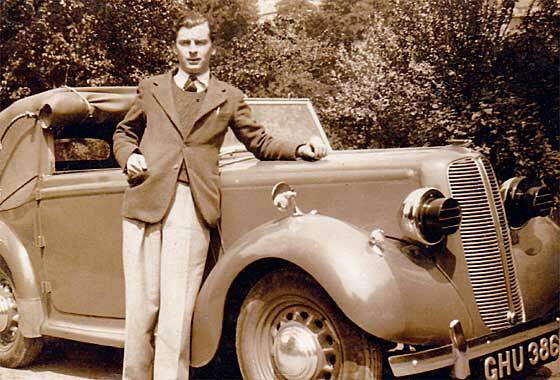 Nice photo showing a car with wartime blackout lighting. This is a 1939 Hillman Minx Drop Head Coupe, made only 38-39. Very similar car is on Help Page 28. One more of a number of photos received from Cicos Florin in Constanta by the Black Sea (Romania) who is interested in old cars of Romania and Constanta. This one features the husband of his Grandfather's sister. The sister is still alive at 92. -- American car made in Detroit Michigan by a company started by a farmhand who made good with American Locomotive Co, and then Buick, walking out to run Willys, then Maxwell. This is a cca 1939 Chrysler Royal C22 Sedan. One more of a number of photos received from Cicos Florin in Constanta by the Black Sea (Romania) who is interested in old cars of Romania and Constanta. This one features the husband of his Grandfather's sister. The sister is still alive at 92. 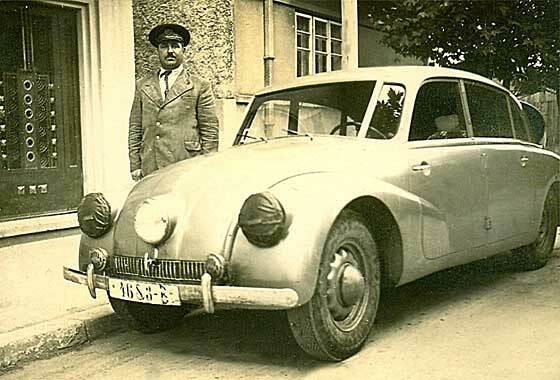 -- The car is rear engined and streamlined, made in the town of Koprivnice in Moravia, third oldest car maker in the world and impressed Hitler via Ferdinand Porsche (born Czecho) a basis for Volkwagen: cca 1940 Tatra T87 Salon. Can we provide year, make and model, asks Jake Jacobs New Hampshire (USA)? 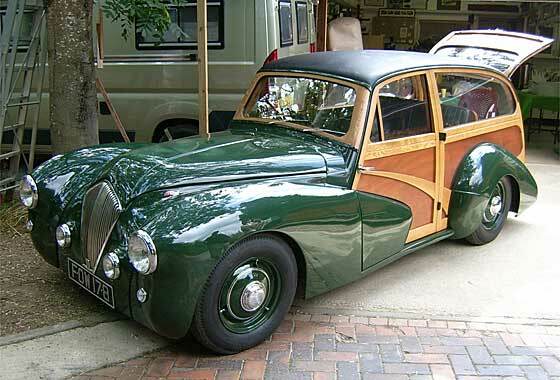 Is this a production woodie or a one-off custom? -- Registered Southampton December 1948, this is a 1948 Healey made by Donald Healey Motors in Warwick. 17 estate cars were made and only two survivors. This car was originally commissioned by Hector Dodds, pre war Riley racer, later completely rebuilt by Classic Restorations with copy of an original woody body. They have built two. Photo received from Alan Weeks of Swythamley Historical Society (UK) saying it was taken around 1922 at Hawkhurst Court in West Sussex, by Courtney Brocklehurst. Lady Helen Brocklehurst is the only person they recognise. -- Stumped by this one. Difficult angle. Our John Warburton thinks a 1904-5 car updated with a 1911-12 (modest) body. Bonnet is small, radiator low, suggesting low hp chassis, dimensions appear modest. Chain drive is v unusual on smaller chassis much after 1906-7.